The tostada compuesta is a delightful Mexican salad recipe. Tostada means toasted and compuesta means mixed salad. This tostada recipe is a complete meal all by itself. I fondly remember making these and especially eating them while working in the restaurant business. 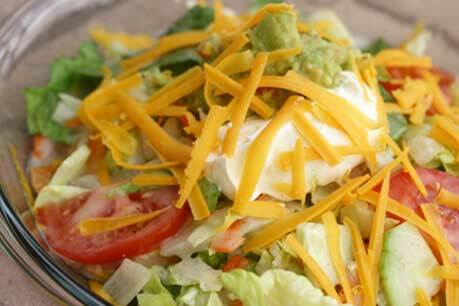 This Mexican salad recipe is one of my very favorites. What makes this recipe special is how we put it in the oven to get the beans very hot before we place the lettuce and all the other goodies on top and let’s not forget the dressing. When the dressing is added, this wonderful aroma sizzles up and fills the room with an incredible aroma. The dressing adds much flavor to the beans and beef. It’s almost indescribable. You can make your own tostada shells by cooking corn tortillas in vegetable oil. Heat the oil on medium high heat in a pan large enough so that the tortillas can lay flat. Using tongs, lay two tortillas at a time in the oil. Turn them over frequently until they become crispy. When the oil stops bubbling they are done. Remove the tortillas to a paper-towel covered plate to drain and cool. Place a tostada shell on an oven-proof dish. Add enough beans to amply cover the shell and sprinkle with cheese. Put the tostada into the oven until the cheese melts and the beans bubble around the edges. Take the dish out of the oven and add a big handful of lettuce or two. Form the lettuce into a pyramid shape. Remember, this is a good size salad–a complete meal. Add 4-6 slices of tomato around the tostada about halfway up the lettuce. Sprinkle plenty of dressing over the lettuce. The dressing is what makes it. If the beans are hot enough you will notice a wonderful aroma fill the room and the plate will sizzle. Scoop a big spoonful or two of beef and place it on top of the tostada. Add a little more dressing on top of the meat. You can substitute chicken for the beef. Just be sure it’s hot when you add it to the salad. Don’t worry, iceburg lettuce holds up well to the heat. Now add a couple of tablespoons each of both guacamole and sour cream. This goes on top of the meat side by side. Sprinkle cheese over the whole tostada and top with an olive. This is a wonderful Mexican salad recipe I’m sure you will enjoy. The only thing missing is a margarita!